Shifters, sometimes called “the weretouched,” dwell in the eastern forests. The eastern shapers created them to replace the elves as their tree-tenders. Created by tainting human bloodlines with animalistic traits, the shifters can take on the power of their bestial bloodlines in a process known as shifting. In the beginning, the shifters could take on more power, becoming hybrids of man and beast or even becoming the beast itself, however the bloodlines have been diluting over the generations, a process the shifter elders are desperately trying to slow. Personality: The personality and behavior of shifters are influenced by their animal natures. Many are boorish and crude, while others are quiet, shifty, and solitary. Like there bestial bloodlines, shifters have a survivalist personality and think of most activities in terms of predator and prey, hunter and hunted. They view survival as a challenge, and strive to be self-reliant and adaptable. Physical Description: Shifters are basically humanoid in shape, but their bodies are exceptionally lithe and agile. They often move in a crouched posture, with a rolling stride while their companions walk normally alongside. Their faces have a bestial cast, with wide, flat noses, large eyes and heavy eyebrows, pointed ears, and long sideburns (in both sexes). Their forearms and lower legs grow long hair, and the hair of their heads is thick and worn long. Their hair is often braided and tied with straps of leather. They often wear simple, practical clothing of animal hide, and wear trinkets of animal bone, predator fangs, and carved ivory. Relations: Shifters mostly want to be left alone. The elves have waged a 500-year guerilla crusade against the shifter cities. Without the forces of the shapers at the shifter’s backs, the elven strikes have only intensified. The shapers generally don’t do much trading, preferring to support themselves on the forest’s bounty and their own hard work. Their long war with the elves has colored their views of humanoids in general. While they don’t kill non-elves immediately, they certainly don’t particularly trust them. Shifters have a strong nationalistic bent, but they are even more loyal to their own tribes. Many shifter communities have long-standing feuds between tribes of shifters with different traits. Alignment: Shifters are usually neutral, viewing the struggle to survive as more important than moral or ethical concerns about how survival is maintained. Those with herbivore ancestry tend towards more lawful natures, while those with predator blood generally are more chaotic. Shifter Lands: Shifters dwell in the eastern forests, living in semi-fortified cities with bronzewood walls. Shifter cities are built into the forest, with structures using the titanic trees as support. The building often come in two or more layers, with wooden walkways running from tree to tree and watchtowers poking out of the canopy to survey the treetops. Shifter communities are often divided into multiple districts, each district occupied by a specific shifter trait. Language: Shifters speak common, and rarely learn more languages. However, they speak a dialect of common that is fortified with guttural grunts, growls, purrs, and other vocalizations. In addition, shifter communication relies heavily on body language. Names: Shifter names usually consist of a personal name and a clan name. Shifters with particularly powerful bloodlines are often giving titles based upon their heritage. 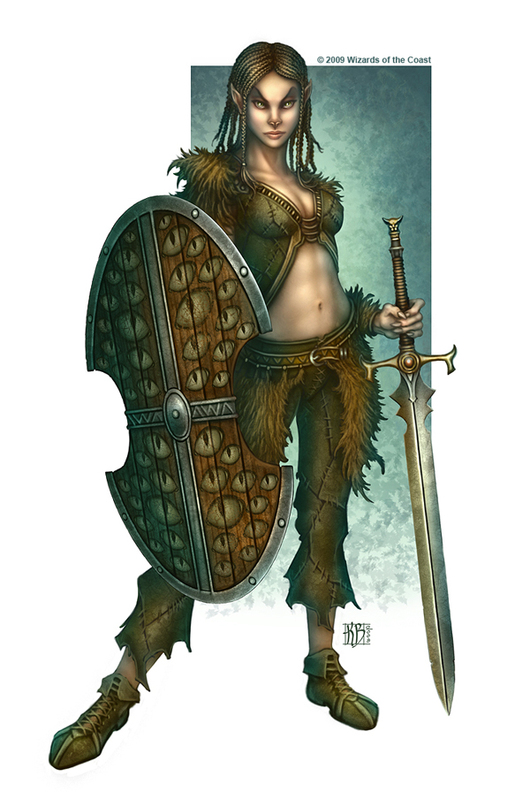 Adventurers: Shifter adventurers are rather common, shifters usually taking on the mantle of ranger, druid, and barbarian. This one is actually entirely fluff, if you didn't notice, because the shifter stats worked perfectly for my purposes. So, I simply saw no need to change them. The fluff, too, mostly fits, so most of it is the same as in the ECS, though I tweaked it in places to fit the setting.